Investors of all types are aligning values for social outcomes with needs for financial returns and recycling of capital. The result is driving a transformational shift in how we invest and address social challenges in our communities. By investing new forms of capital into innovative initiatives that seek to leverage business practices to achieve a social purpose, impact investing attempts to achieve a more sustainable and scalable solution to environmental and social challenges. This blending of proven commercial practices with social aspirations is attracting greater amounts of capital from a growing number of investor types, such as large national foundations, institutional investors, endowments, municipalities, venture funds and angel networks. At the same time, philanthropists of all kinds are utilizing both their base of invested assets and grant capital to drive impact through impact investing. The combined effect is producing a new age of innovation among entrepreneurs, business models and capital structures that seek a dual purpose (a “double bottom line”). According to the Global Impact Investing Network impact investments are defined as investments made with the intention of generating measurable social and environmental impact alongside financial return. Such investments can provide capital to a range of businesses and funds that generate sustainable and scalable solutions to problems that cannot be realized by negative screen investments or philanthropy alone. Started in 2015 by the G8, the Global Social Impact Investment Steering Group (GSG) was established to catalyze the global social impact investment market. Below is their introductory video on impact investing. The Case Foundation, created by digital pioneers Jean and Steve Case, “create programs and invest in people and organizations that harness the best impulses of entrepreneurship, innovation, technology and collaboration to drive exponential impact.” Their efforts to drive social change are focused on three key pillars: revolutionizing philanthropy, unleashing entrepreneurs and igniting civic engagement. To learn more about their current work, click here. There is a range of investor mindsets. The mindset of the impact investor is focused on intentionally setting out to deliver positive social or environmental impact and financial return. 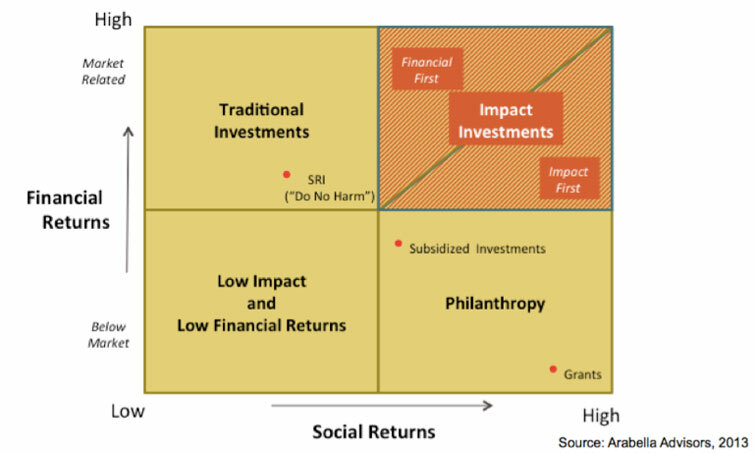 However, many social impact investors are likely to start out with either a traditional financial capital or philanthropic mindset. Traditional investments are usually made without consideration of social or environmental impact, and philanthropic contributions are generally made without regard to financial returns. Impact investing incorporates “both/and” thinking. Impact investing lives on a continuum of investing opportuntites. Understanding the primary driver and the underlying business model will help you better gauge your place on the continuum. It is not uncommon for investors to fluctuate across the spectrum based on specific or unique opportunities to achieve revenue and social impact goals.